It's mid-March here in Michigan and the feeling of spring is in the air. But it's not yet reenacting season in these parts. 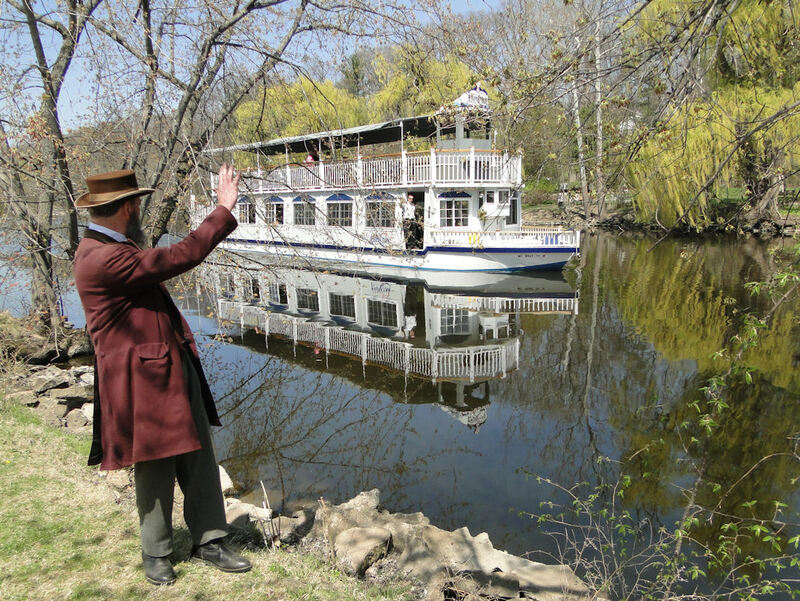 Yes, we've had a run of beautiful weather - mid-40s through mid-60s for over a week now - but because we never know what the weather will be like this time of year, there are no reenactments held until the usually more dependable month of May. 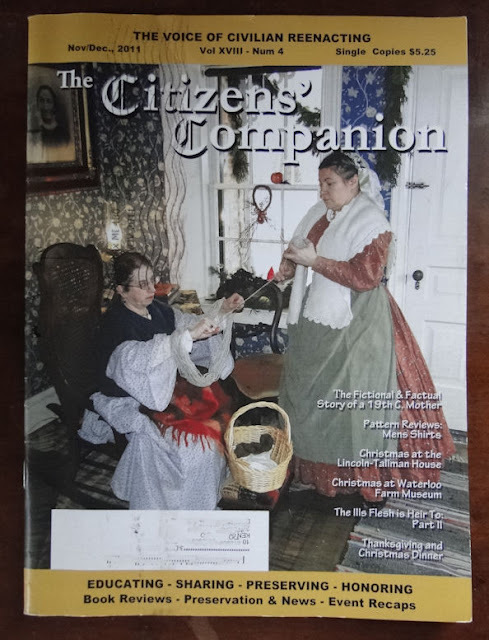 I've been able to do a few little wintertime extras here and there, such as A Night at the Museum, visiting the (indoor) Henry Ford Museum, and even period dress meetings, and these little asides do wonders to help me through this tough season. 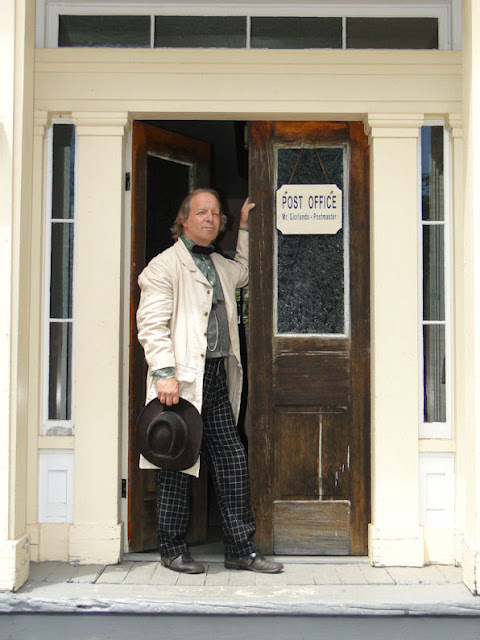 But I am biting at the bit for the time when I can be amongst many other living historians of the same ilk, surrounded by history and bringing it to life. So I have been spending some of my time journeying through the past - my past - or, I should say, my reenacting past via the many many photographs I have in my collection. And as I skimmed through these pictures, there were a few that really stood out and caught my eye and gave me a flood of memories. Or they gave me that certain aura...or ambience maybe, for many also seem to have a distinct feel to them; more often than not, the images I chose to present here are like "scenes from the past" meant to evoke a sort of peering through a time-travel portal rather than posed likenesses along the lines of a tintype. The few I chose here represent some of my favorites. I hope you like 'em, too! 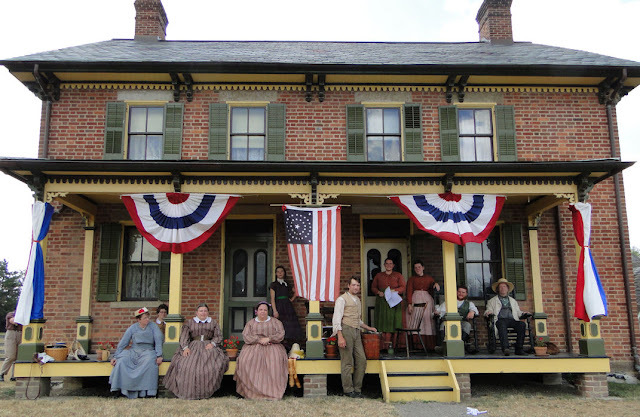 I am so very lucky to have a historic house at this event that I can call "my home." Yes, it's true - this mini-open-air museum allows me and a few others to utilize the 1840s Sixberry House as if it belonged to us. Of course, we treat it with all of the respect it deserves. Part of the scenario in previous years was showing the Post Office I ran out of our home. 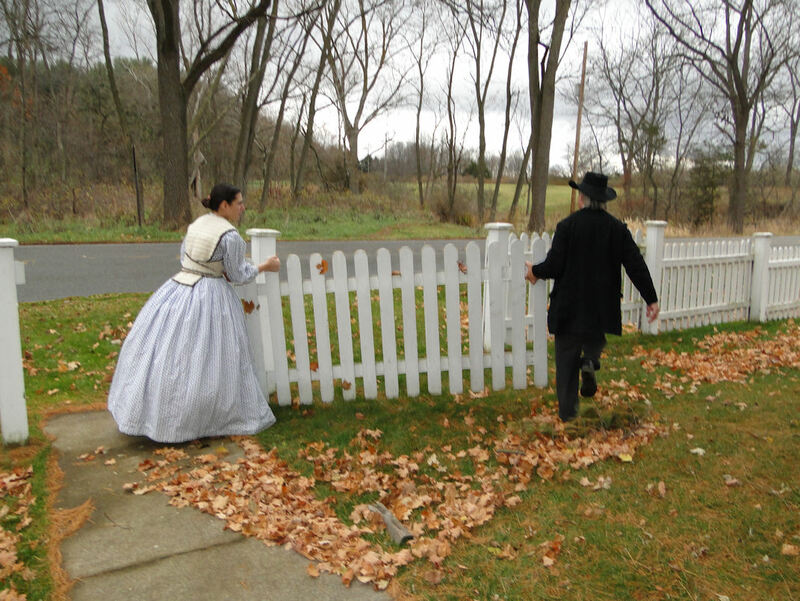 This was a common practice in small towns in the mid-19th century. I have to thank the good people of Charlton Park for allowing me and my friends to use the historic 1840 Sixberry House in such a way. I am honored to be allowed to do so. My real wife really doesn't care for 1st person/immersion (though she will do it in a pinch when needed), so a few of us have formed a reenacting family. And that's what you see in this picture: from left - my "sister," my "wife," and my "mother-in-law." 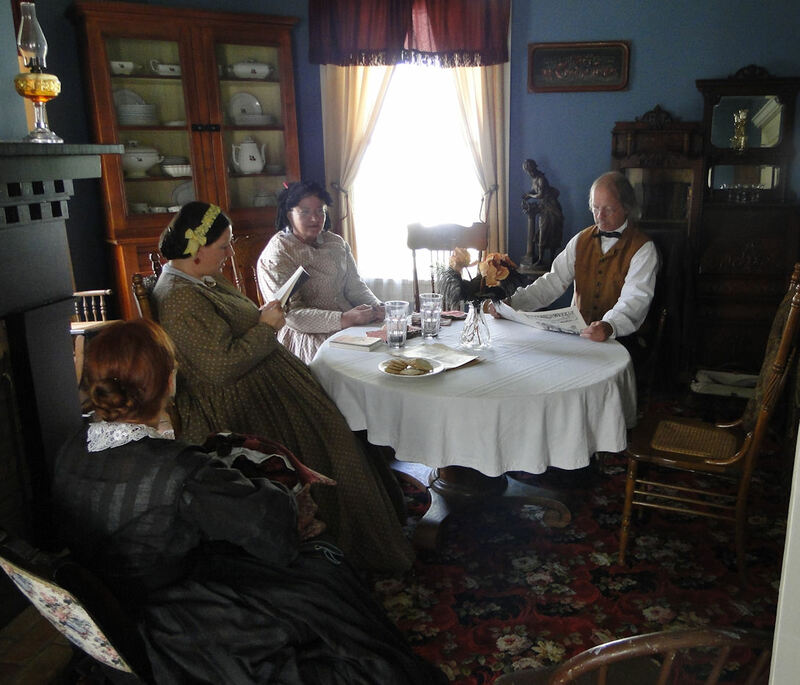 We all work very well together in creating a scene that will help draw visitors into our world of over a hundred and fifty years ago. Yes, we do our best to stay in 1st person the entire time. Carrie has done such a fine job as our servant girl that others have attempted to steal her away. But she is a devoted worker and, thus, stays with us. Using actual historic buildings to help bring the past to life always adds so much to the entire feel of the reenactments. It's like you are there, in a town in the past, rather than at a tent-city reenactment. Here we find a few men enjoying a peaceful afternoon moment at the local barber shop. Kristen is a school teacher in her 21st century life. 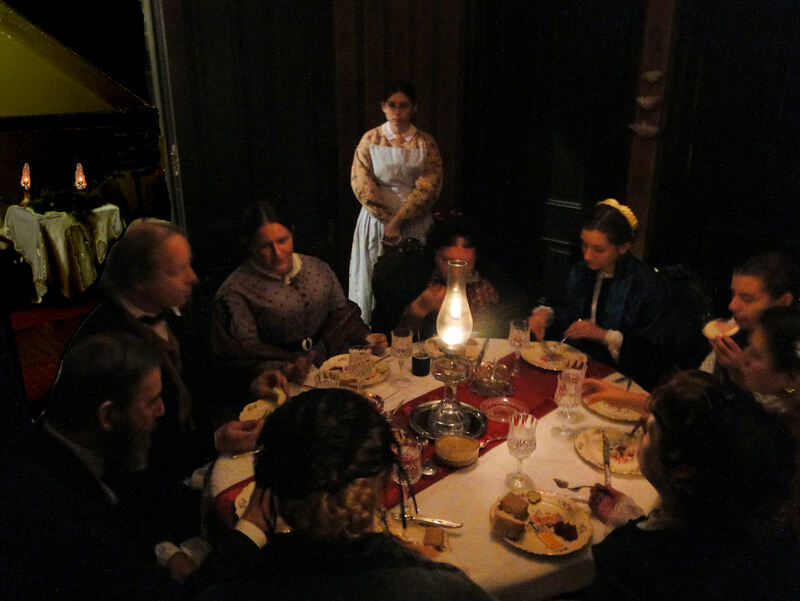 She is also a teacher in her 19th century life where she really does give period-correct lessons to the children. 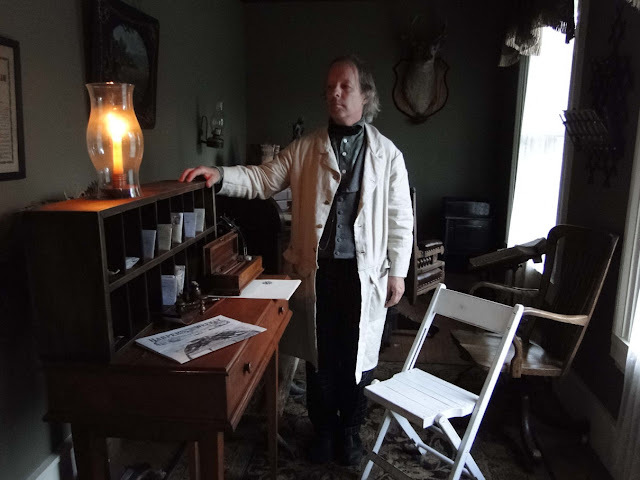 And it doesn't get any better than doing so inside a school house from the 19th century. Can you not feel the apprehension these two ladies must have felt as they watch a few military men gear up for a possible battle? This is one of my very favorite of all living history photos that I have taken. 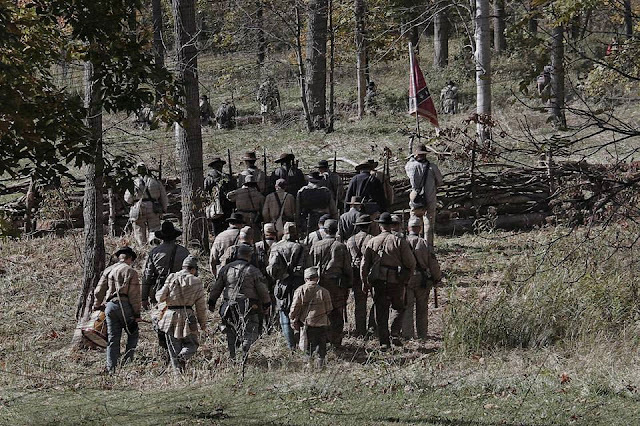 After the battle had ended, the civilian townsfolk joined the doctors and nurses to help care for the wounded and try to identify the deceased. 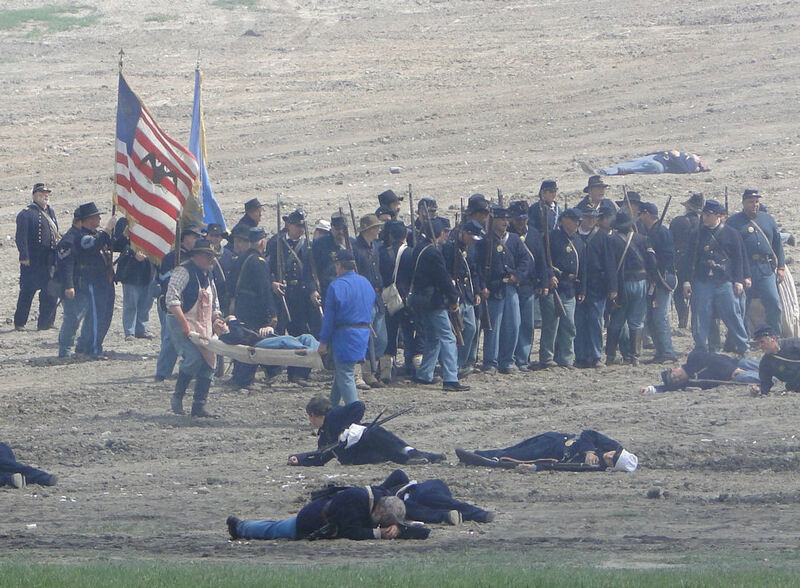 This is the way battles should end at reenactments instead of the ridiculously silly "the dead may rise" comment usually used. Showing the modern audience that even though the battle had ended, the after effects lingered on, is just as important as the battle itself. I am very proud I was able to be a part of this scenario. 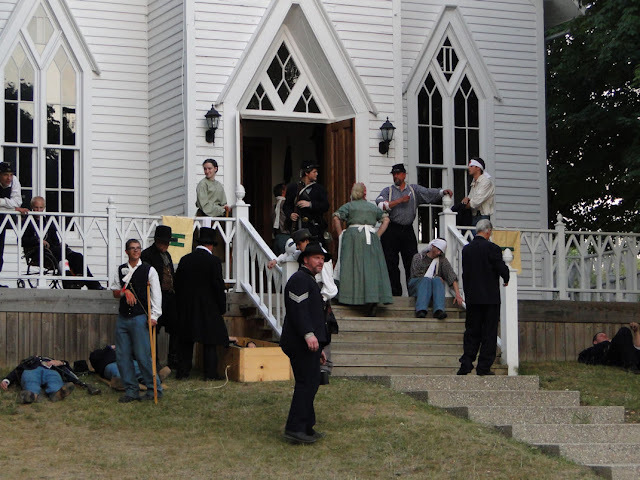 You've read about it in history books and now you can actually see how the aftermath of the battle continued in nearby towns as the wounded convalesced in one of the local churches. A fond farewell to our local Boys in Blue. 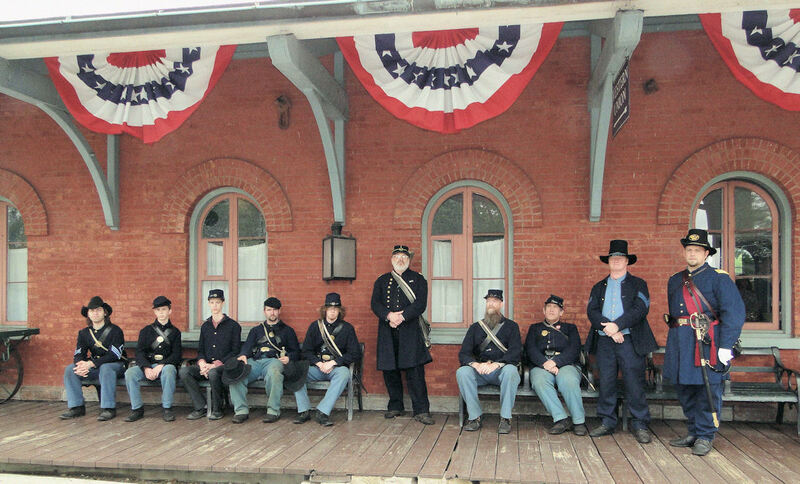 We did a scenario where the local military accepted a number of Confederate prisoners to take to Elmira prison. 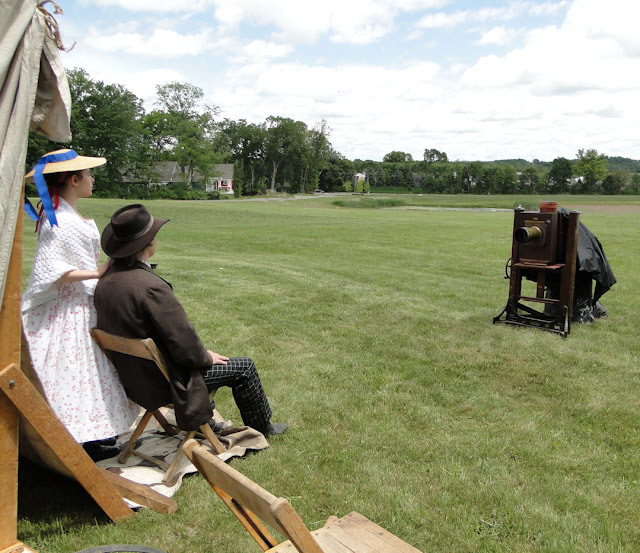 Though there were not very many modern visitors around to watch the action, it was received well by those of us who took part. Military members of the 21st Michigan Volunteer Infantry. Well, except the two men on the right. They are very good friends who helped us out in a scenario. 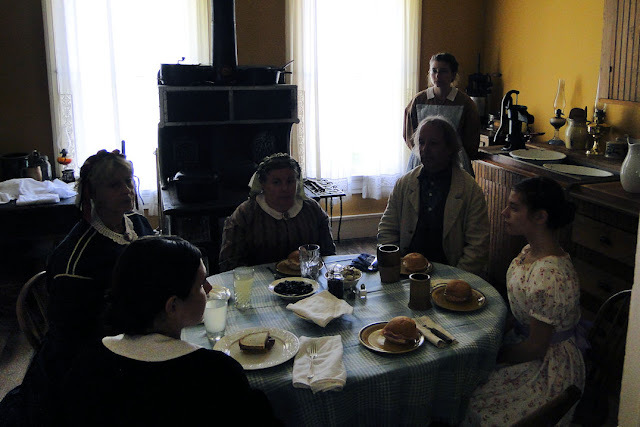 Sue King Black, Gettysburg, Friday June 26, 1863: "I had a Union apron, but lent it to Mary Miller at Boyers, but the Rebs got it when they ransacked the Boyer's house." When I saw Mrs. Geyman standing as you see her here next to the 1831 Ackley Covered Bridge, I quickly whipped out my camera to snap what looked to me to be almost a real-life painting. 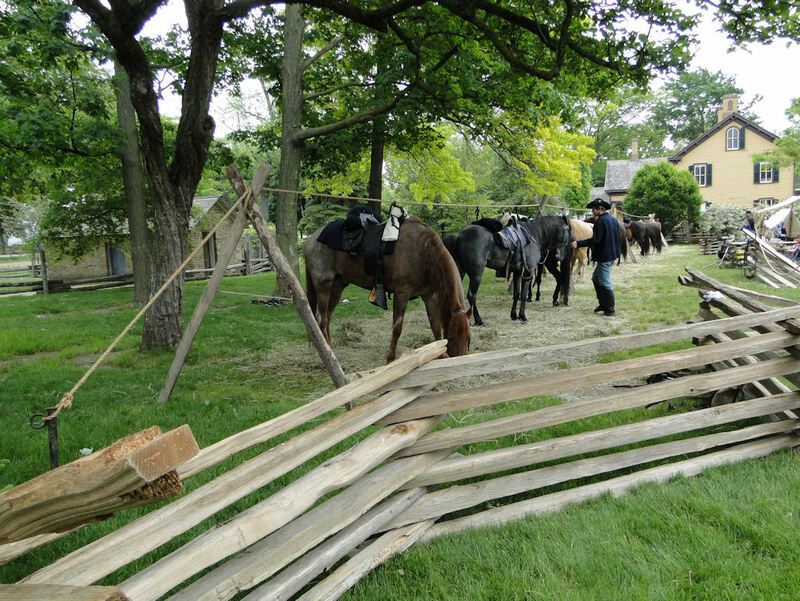 When the cavalry comes to town, the horses need a place to stay. Next to a boarding house is as good a place as any. At the Susquehanna Plantation originally from Maryland. I enjoy the 'southern feel' of this photograph. 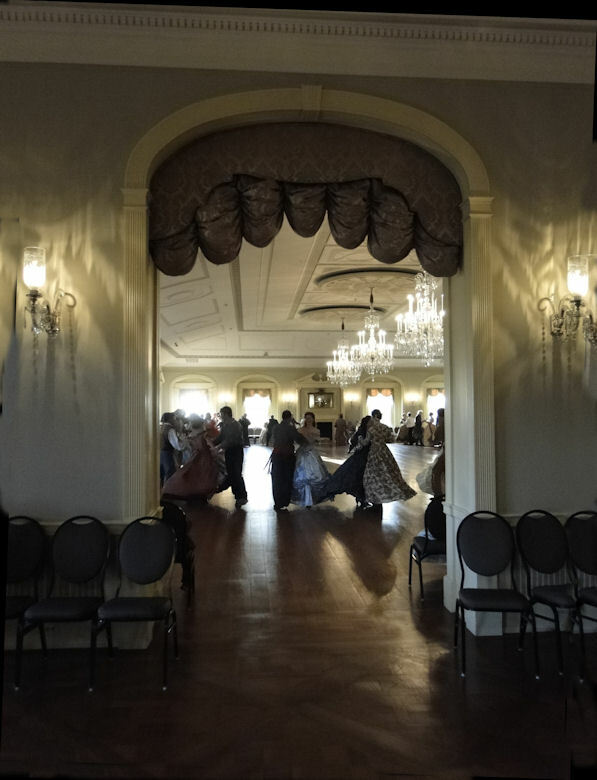 The formal ball at Lovett Hall. 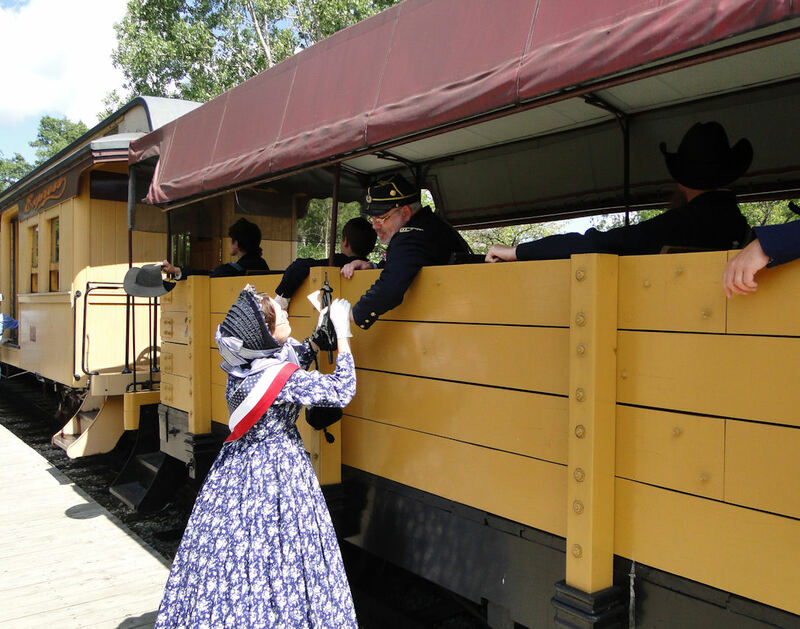 The good folks at Greenfield Village throws a ball for the reenactors every Memorial Weekend. I followed my three friends here purposely for photo opportunities. I wasn't let down. 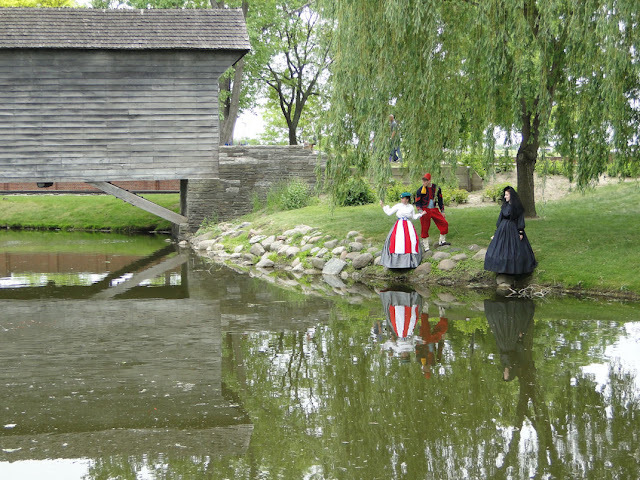 This one near the 1831 Ackley Covered Bridge is one of my favorites. 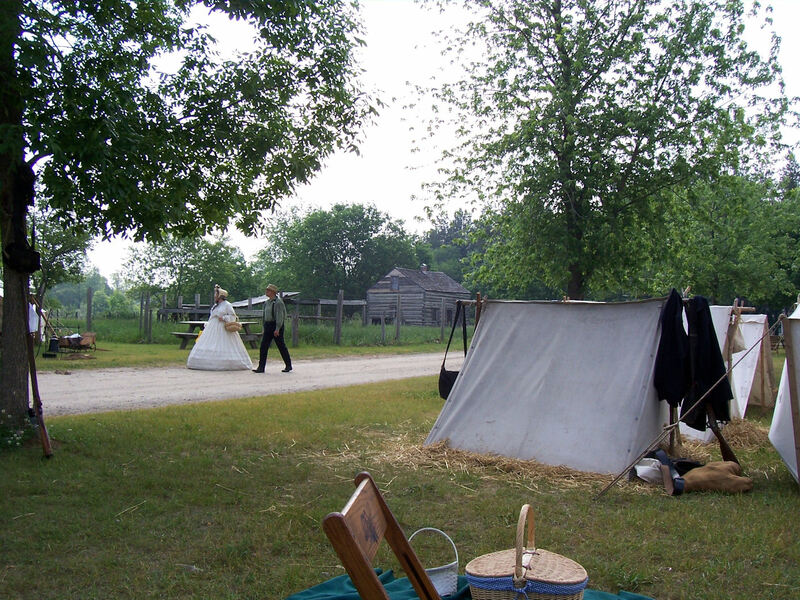 Over ten years ago, Crossroads used to have a Civil War event. 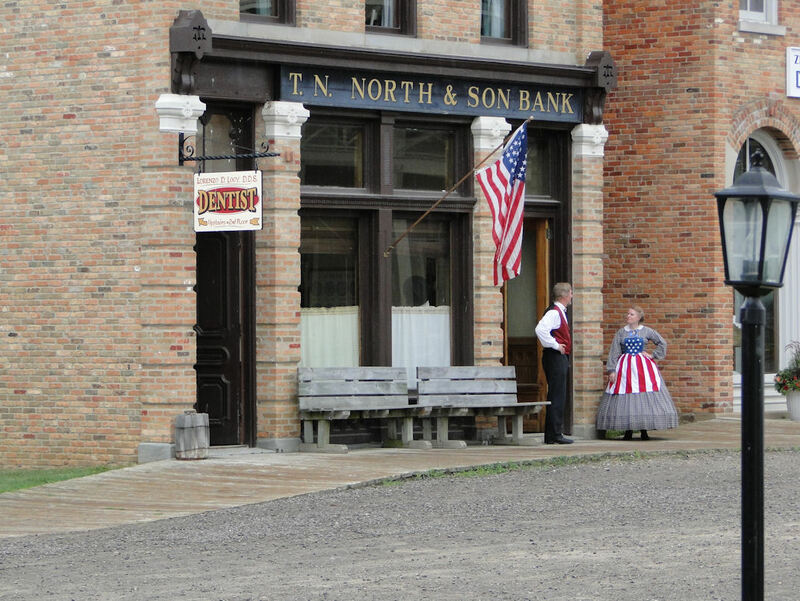 With the dirt roads, log cabins, and rural small-town feel, it was the perfect spot to show this important time in our nation's history. Unfortunately, due to the fact that the person who runs the entire parks system of Genessee County, including Crossroads Village, does not understand history, the event is no longer around. Because of the authenticity of the lay out of Crossroads, the event was very popular for both soldier and civilian. The Rebs kept marching on. Doesn't this look like the real deal? And the battles themselves were very realistic as well and gave the visitors quite a history lesson. But to this day the person in charge of Genessee County Parks refuses to allow anything that might even have the shape of a gun, much less a battle, on the grounds. Well, you know, guns had nothing to do with the formation and the keeping together of our Nation now, did it? Back in 2010 I took part in a civilian-oriented event, where we threw a big welcome home ceremony for our boys in blue who were on leave for a weekend. There were speeches, games, and a picnic, among other activities. We made very accurate and authentic looking townsfolk during this event. It was very patriotic, and the visitors repeated over and over how much they enjoyed having us there. I was told our event was the number two event for Crossroads that year, second only to Thomas the Train. See? There is room for everything! 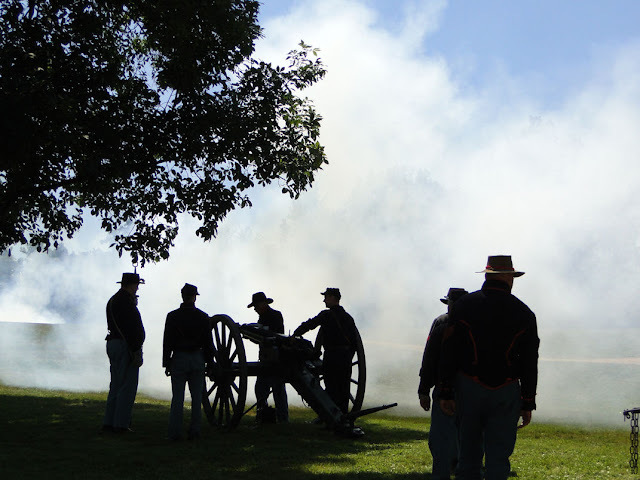 It was also mentioned quite often by visitors that they hoped a full Civil War event - battle and all - would take place. 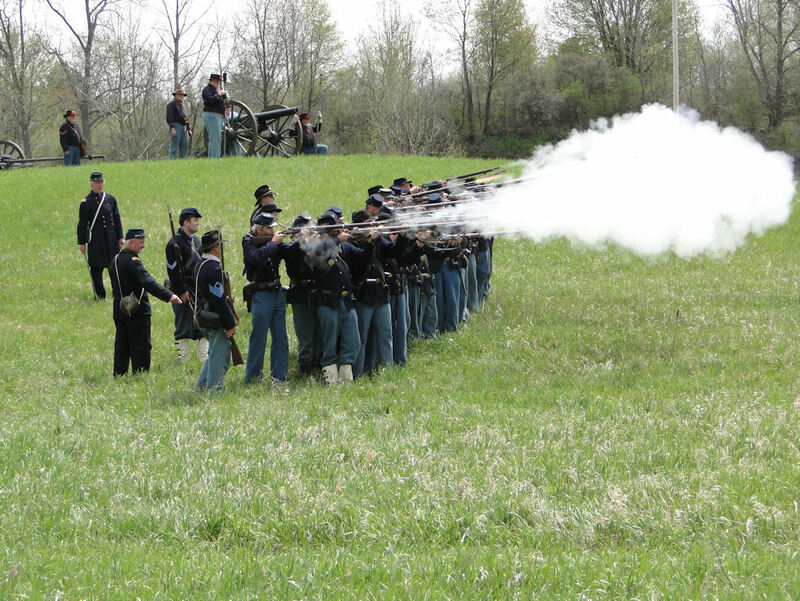 No guns - just the men in their Union Blue uniforms. The next year we were asked back to recreate our scenario...but without the soldiers. I was pretty darn proud! The realism one saw at this event, whether a visitor or participant, just made one feel as if they stepped back in time. And isn't that the point of such a place? 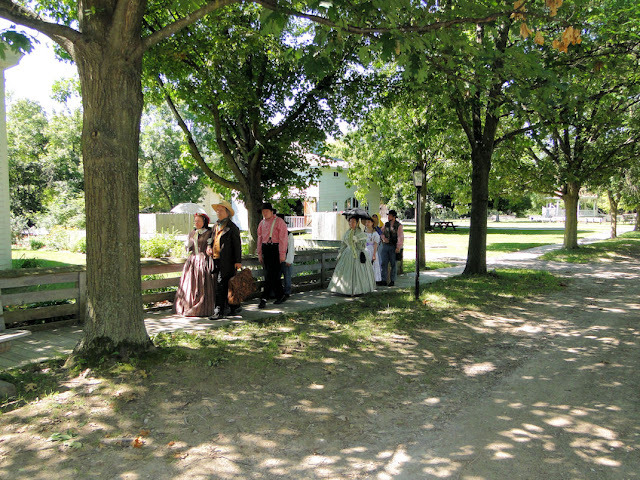 And it's because the grounds of Crossroads have a very authentic Victorian feel to them, that nearly every summer a few of us will still dress period and venture out to the place to take in the historic presence. I wish they would allow me to run Crossroads Village instead of someone who wants to make it into a children's playground. 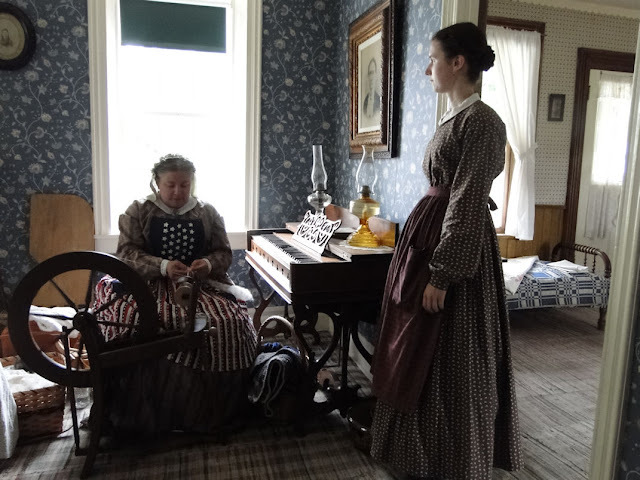 So, while we were creating our own type of visitor event, our domestic servant, Carrie, fell right into her role during our visit. That's shows just how good she is! Carrie, really, we are just visiting. 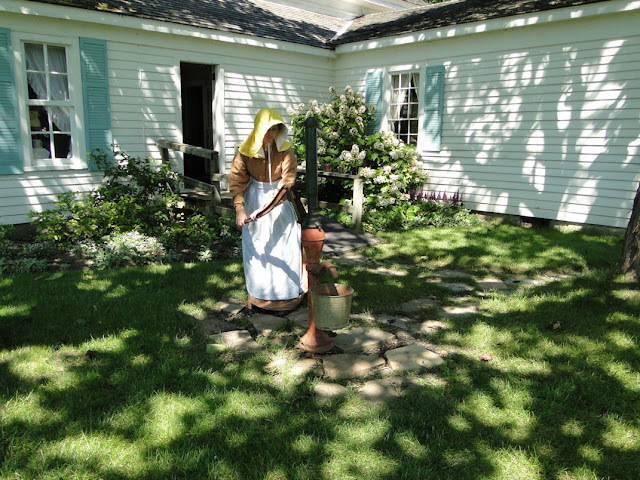 You do not have to pump for water to clean up the dishes. 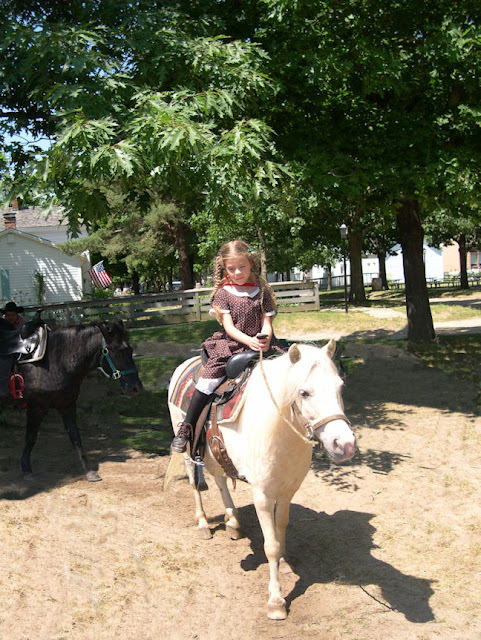 My daughter on a horse at around six years of age. As mentioned earlier, Kristen often portrays my daughter during our scenarios. As part of our backstory, my wife and I only had two children - both girls - and because there were no male children, I raised my eldest, Kristen (Christine) to do men's work. Here she is helping me to mend a fence. Yes, she really did help me out here during an autumn living history dinner at Waterloo Farm. 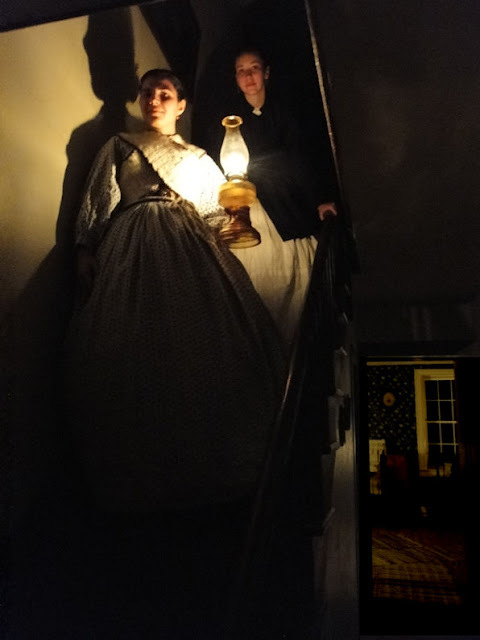 We stayed late into the evening on this same day, and my two "daughters" (Kristen and Jillian) got the feel of what a pre-electric house looked like at night. There was no light switch to flip on a lamp to brighten the hall. Only the soft glow of the oil lamp. It makes going up to bed quite a different experience. 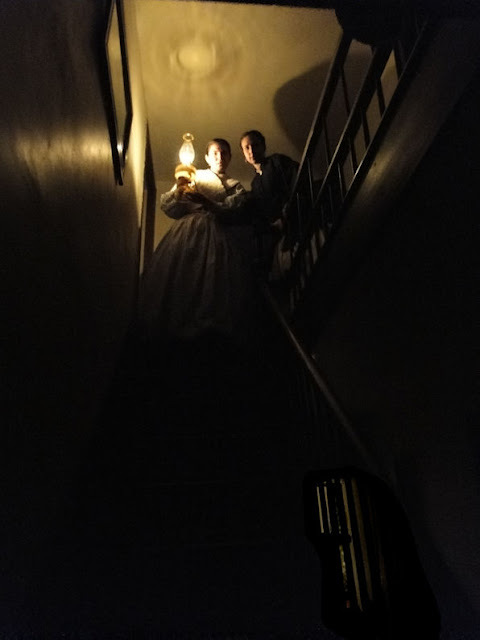 The girls stuck close together as they walked down the dim-lighted staircase. Another year, another scene at Waterloo Farm. 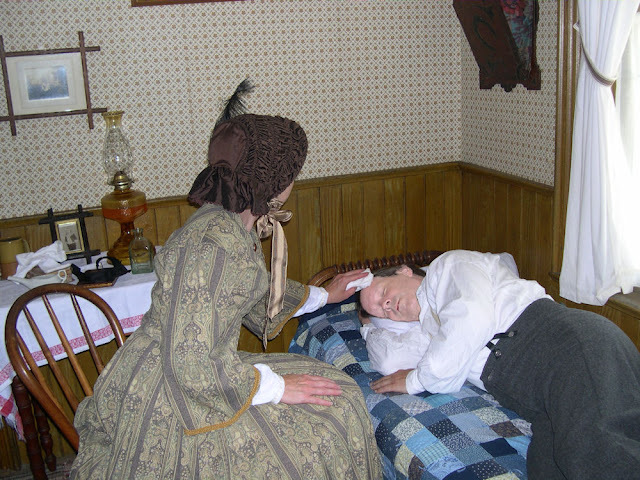 When I was in the Michigan Soldiers Aid Society, we did a home remedies scenario. I spent the afternoon portraying a sick husband while my "wife" cared for me. And she really did sit by me for most of the time, wiping my brow and having me drink home remedy medicine from an invalid cup. We stayed in 1st person the entire time - this was one of my first times ever doing anything to this extent. 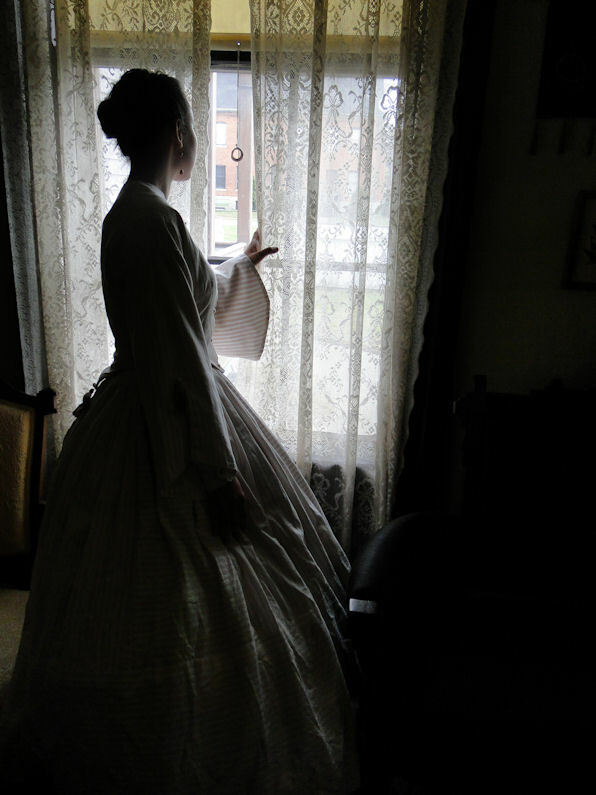 It was a pivotal moment in me going from reenacting to living history. There was another time while at Waterloo Farm where we did a funeral/mourning presentation. No, it wasn't for me - I recovered from my illness, thank you very much! 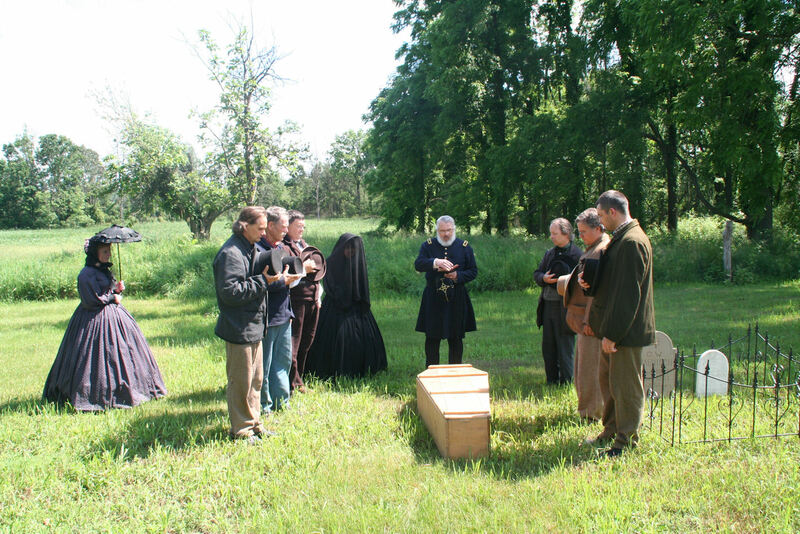 But we did have a coffin, mourners inside the house, and then a funeral procession outside. We then walked to the graveyard where a full funeral service was held. 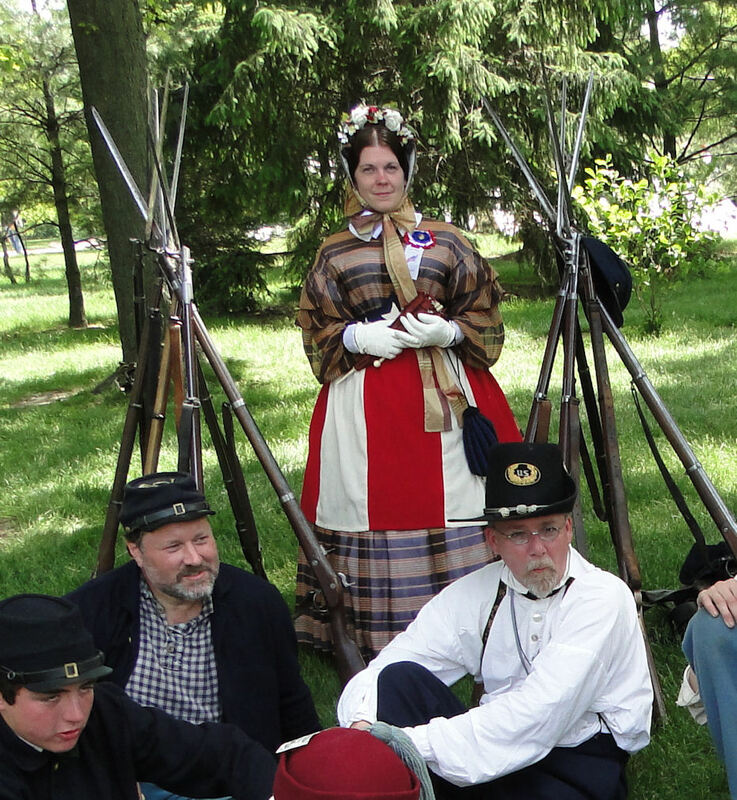 Again, this was an early high-mark in my evolution from regular reenacting to living history. And then there are the peaceful moments of a Sunday afternoon, with only the whrrr of the spinning wheel making any sound. We also do an 1860s Christmas on the Farm presentation, where we try to show how farm families celebrated Christmas in a more simple manner than our city counter-parts. Yeah...I am pretty darn proud of this one, too! 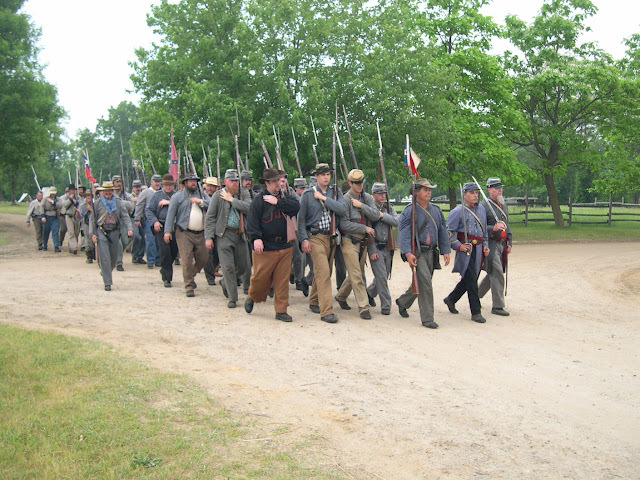 The largest Civil War reenactment in Michigan takes place in Jackson. There are times when there are a couple hundred soldiers on each side and the public gets a good hint of what a battle was like. Again, from Henry Eyster Jacobs (Gettysburg, night time of July 1, 1863) - "I heard a wounded forsaken soldier crying in his soft southern voice, 'Water...water.' He kept calling, calling; and that solitary cry, its anguish uplifted in the pitiless truce of the night, racked the very heart. I fell asleep with his anguish wailing in my ear." Yes! 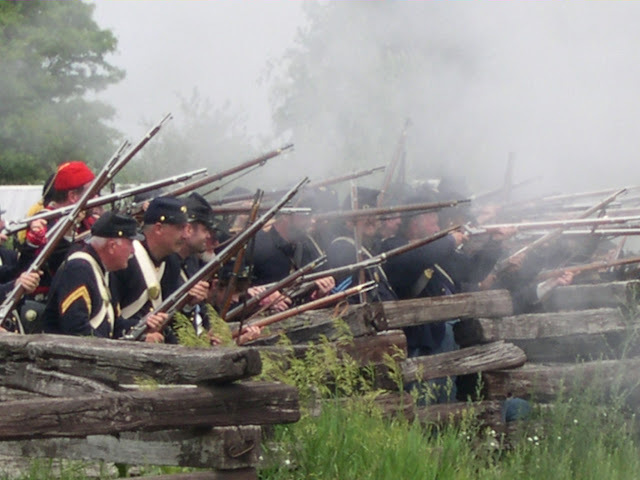 I caught the smoke coming directly out of the musket barrel! As my shutter speed is not the quickest, it takes me a dozen shots to get one like this. 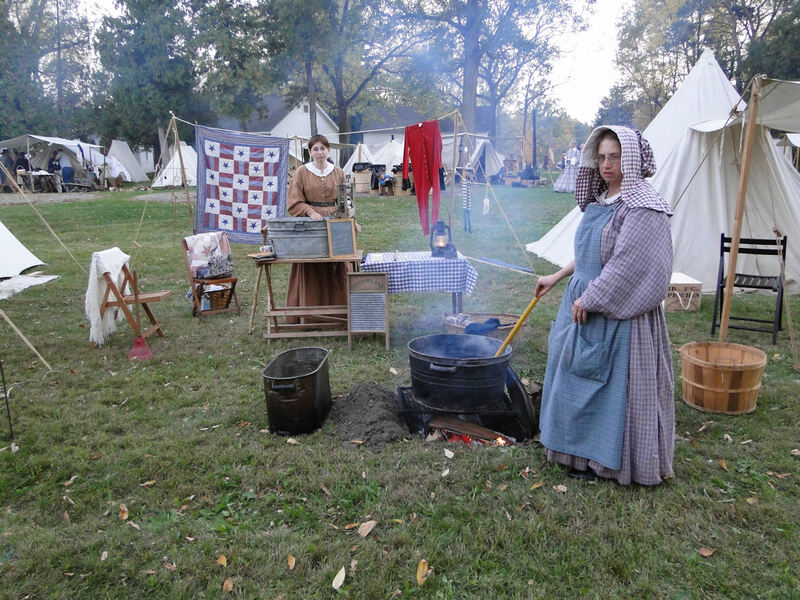 What we have here is a very realistic camp following laundress and her helper. 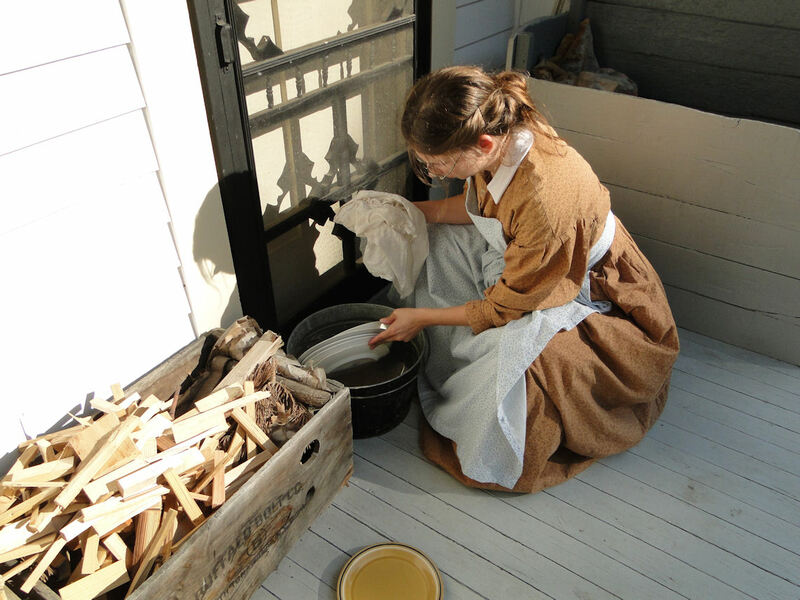 The thing about this living historian is that she actually does reenactor's laundry and has bartered for her pay, which includes pies and other foodstuffs in exchange for having their laundry done "the old-fashioned way." 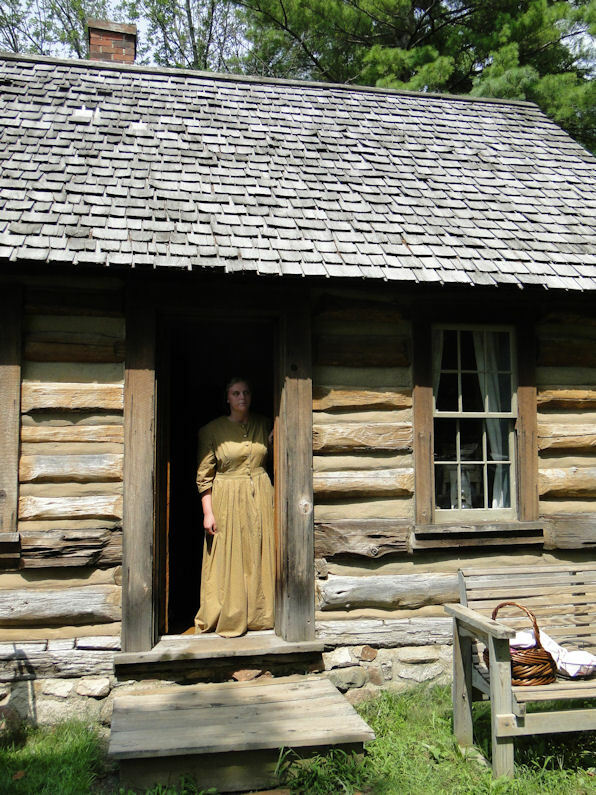 No ipods, cell phones, tablets, or electronics of any kind - not a single luxury. And yet these kids don't stop playing from morning til evening. 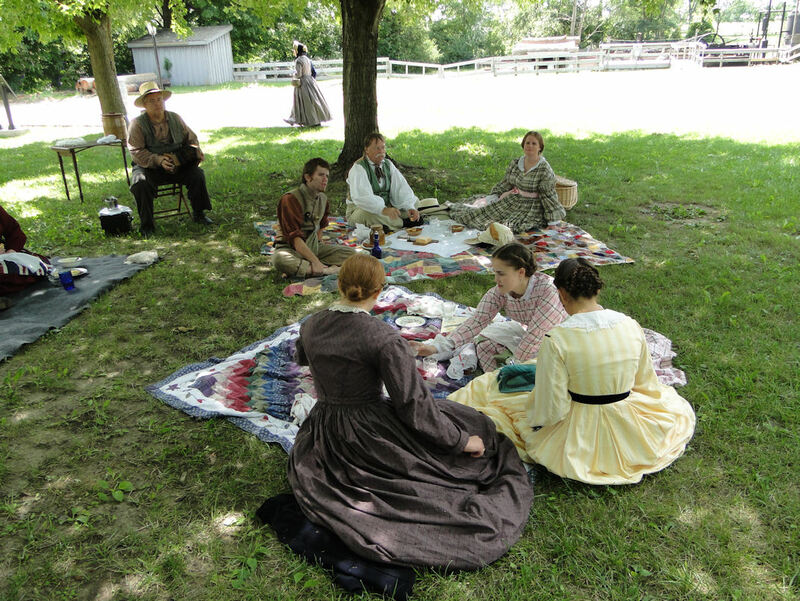 Of course, if this truly were the 1860s, the kids seen here would have spent most of their day working alongside their parents. 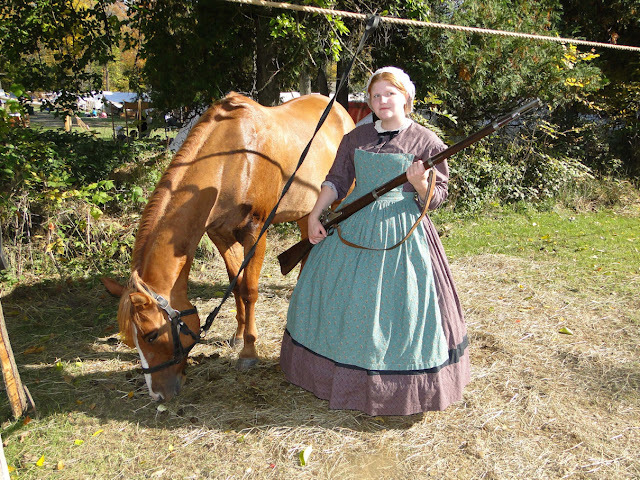 There's just something about a hoop-skirted woman with a gun that just looks so cool. I think the expression on her face just about says it all. I did not take this picture - my friend Lenore did - but to me it effectively depicts Rebels marching into battle. It almost has the feel of an original that has been digitally colorized. My daughter and I got our tintype taken. 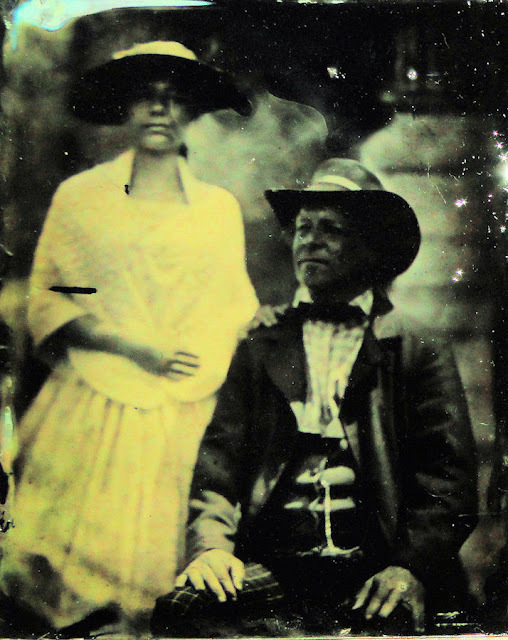 The tintype didn't come out near as well as I had hoped, but it still is great to have this moment in time showing when and how our image was taken. Another location that will allow a few of us to utilize their old Victorian homes is at Historic Fort Wayne in downtown Detroit. Just as we do at Charlton Park, we sometimes create a family scenario and will remain in 1st person, while other times we just enjoy being surrounded by history while in period clothing. Either way, it can make for wonderful photo opportunities. 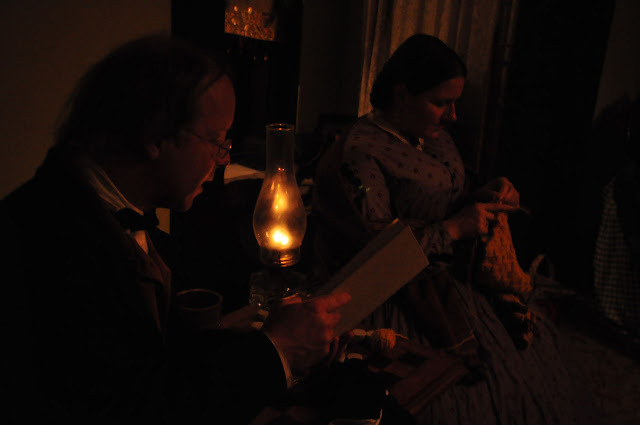 Christmas at the Fort, showing how city folk celebrated Christmas in the 1860s, is easily in my top five of favorite events, for we go into full immersion here. 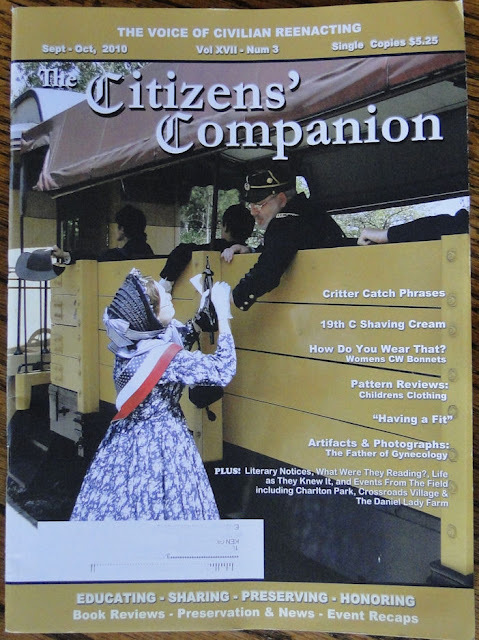 This initially was difficult to an extant because this was the first time we had to create a family of the 1860s from scratch, even though none of us are actually related. But we have worked together in this capacity for years so now it comes very naturally for us. 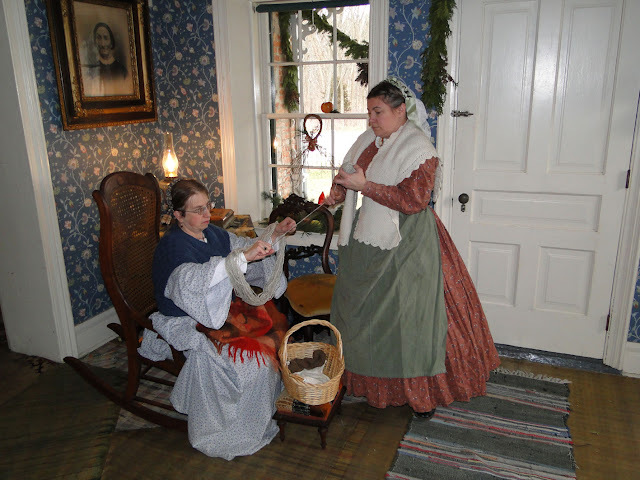 This event never fails to bring the magic of Christmas past to life very effectively. In the photo here I am sitting next to my 'reenacting wife' while reading aloud Charles Dickens' "A Christmas Carol" by the light of an oil lamp. 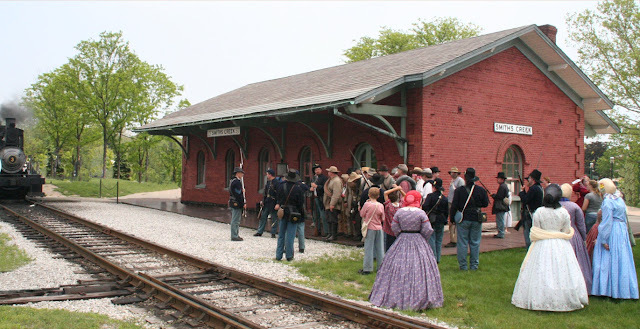 A real living history event. 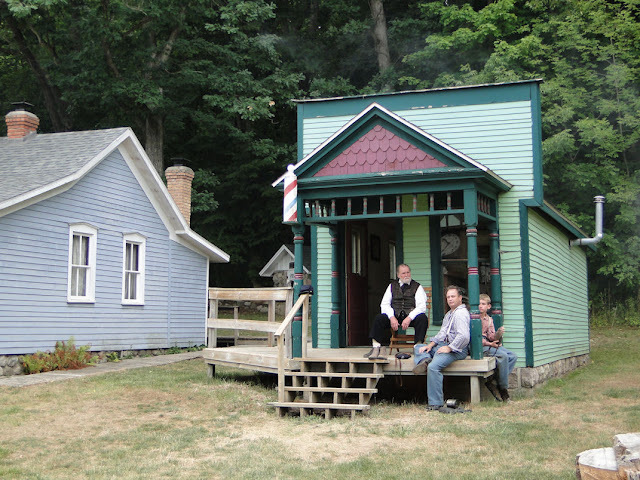 That's what I like about Port Sanilac - we can do whatever type of scenario we want, for it's "ours" - that is, we are the host unit, therefore whatever we decide to do, we do. We've recreated Gettysburg, 1st Bull Run, and a county fair. And, for the most part, we do this in a 1st person manner. 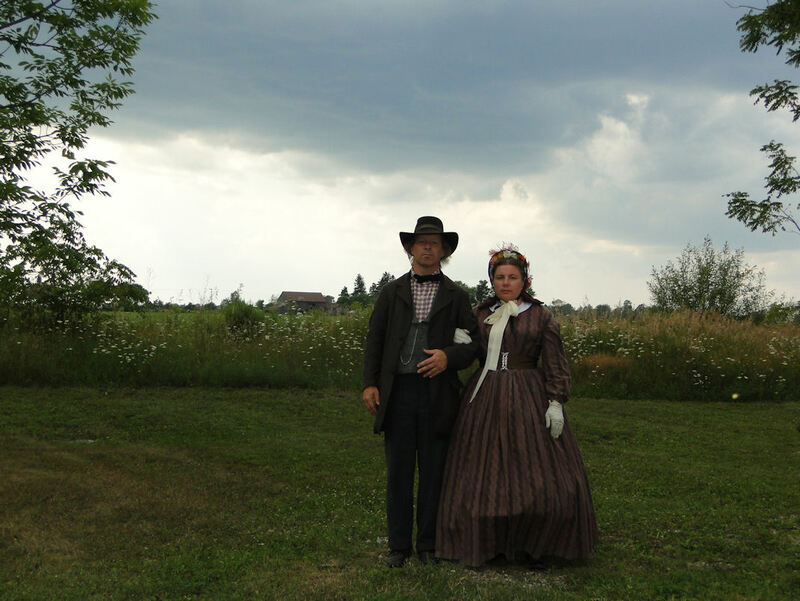 My wife and I on our farm. Well...not really...I mean, yes, the woman in this picture really is my wife, but, no, we don't live on a farm. But it kind of gives that impression, doesn't it? I asked one of my friends to pose for a series of pictures depicting life in a log cabin, and this one ended up being my favorite. 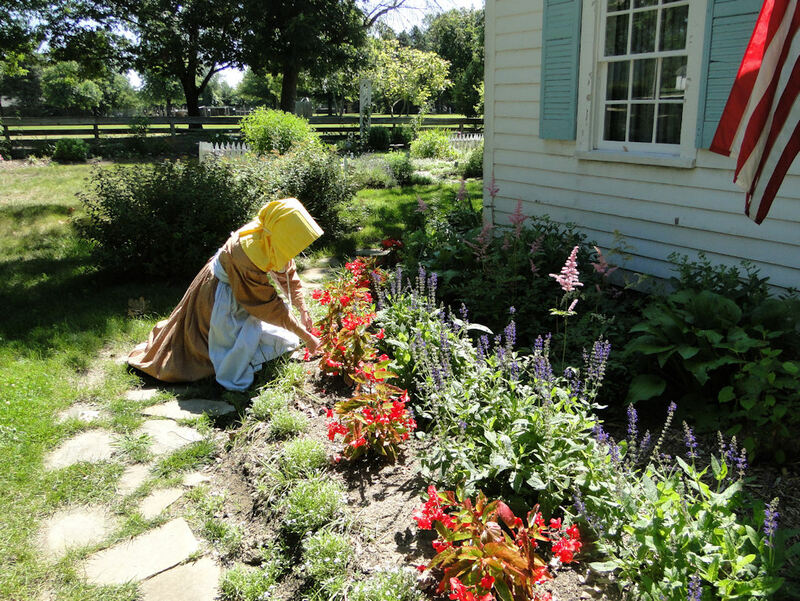 I can just feel her despair, loneliness, and longing as she takes a short break from her daily chores. Every picture tells a story, right? Well, I believe a book could almost be written with this picture. 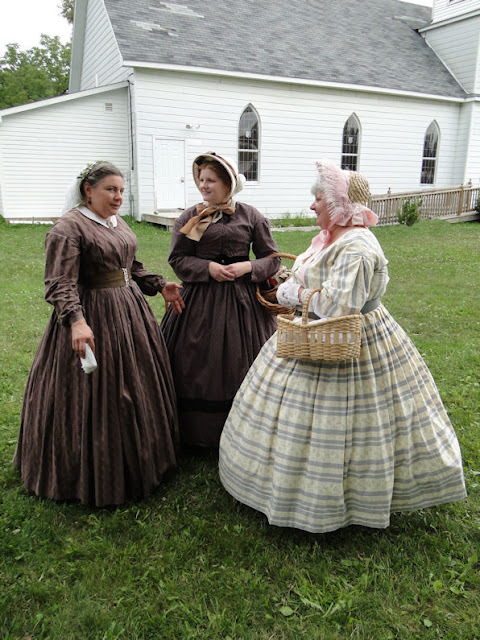 The battles at our Port Sanilac event can be along the lines of Charlton Park and include the involvement of civilians. 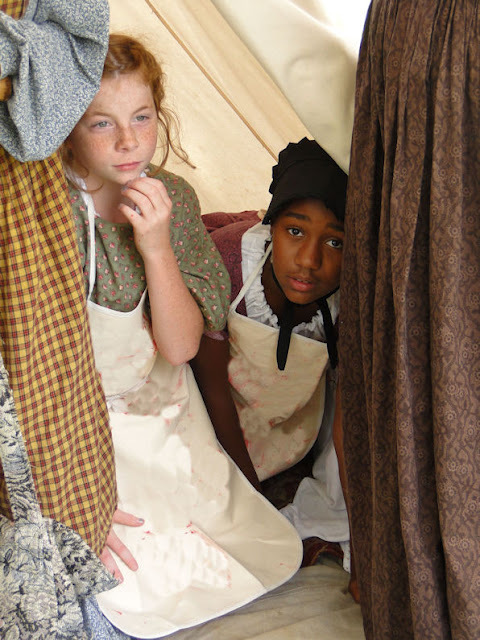 Right in the midst of the excitement of the battle during our Gettysburg reenactment, I happened to turn to see these two young girls hiding fearfully behind the skirts of their mothers. I fumbled for my camera, hoping nothing would change before I was able to snap the picture. I am so thankful I was able to get it! 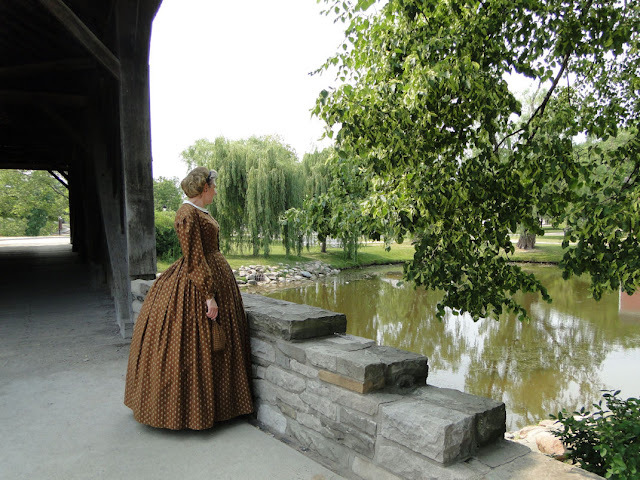 One of the very cool things about having period clothing is that you can do very cool period things in period places. Period. 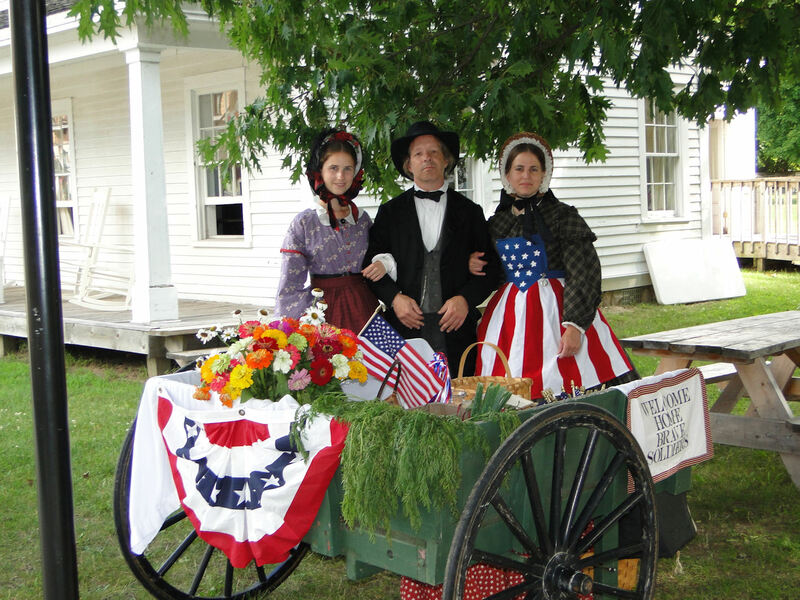 On July 4, 2012, a few of us wore our 1860s finest and visited Greenfield Village to enjoy this very American holiday. I did an entire blog posting on it with loads of pictures. 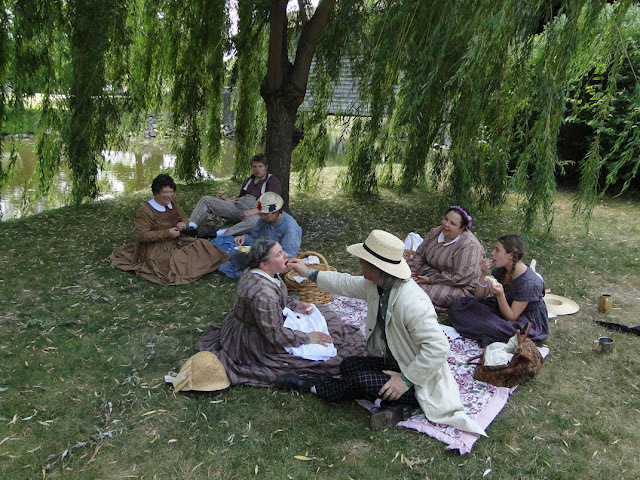 The photograph here of us enjoying a picnic near an 1830s covered bridge and 'neath a weeping willow was one of the high points of this day. July 4, 2012: we also took a group picture at a house suitable to our fashion - the Firestone Farm, authentically and patriotically decorated. The farm presenters willingly joined us in having our images taken. Here is a photo I wish I had taken but I didn't, and I do not remember who did, but I love it. This is my son Miles. He enjoys spending most of his reenacting time playing in the water in a sort of Huck Finn style. 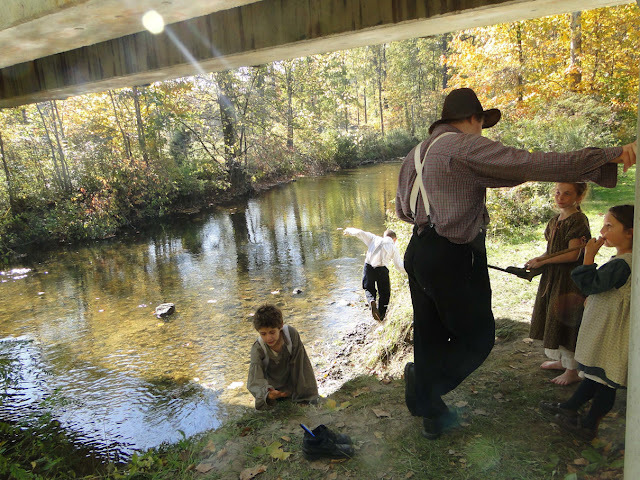 In fact, he kind of fits the Huck Finn/Tom Sawyer look, doesn't he? I could easily throw in another couple hundred pictures and consider each a favorite. Instead, maybe I'll do a part two sometime. Anyhow, I hope you enjoyed traipsing through my reenacting past with me. And with the reenacting season here before you know it, there will be plenty of new/old pictures to share and show. our staff dressed in period costume. Oh wow, what a post Ken! I know that must be so much fun, I'm glad you share so much of it with us. Love the last photo, cute! I am so envious of these wonderful locations you have at your disposal! Excellent post.